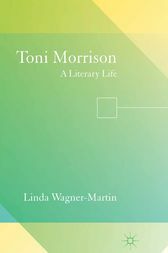 A reading of the oeuvre of Toni Morrison — fiction, non-fiction, and other — drawing extensively from her many interviews as well as her primary texts. The author aligns Morrison's novels with the works of Virginia Woolf and William Faulkner, assessing her works as among the most innovative, and most significant, worldwide, of the past fifty years. Linda Wagner-Martin is Frank Borden Hanes Professor of English and Comparative Literature at the University of North Carolina at Chapel Hill, USA. She has been a Guggenheim fellow, a Rockefeller awardee, and a resident at Bellagio, Bogliasco, and the Bunting Institute. She recently received the Hubbell Medal for lifetime service to American literature. Her 2013 A History of American Literature from 1950 to the Present is her 53rd book. She has written two other books for this series, one on Ernest Hemingway and the other, in both 1999 and 2003, on Sylvia Plath. She writes widely on twentieth-century American literature, biography, women's writing and pedagogy. Her publications include A Historical Guide to Ernest Hemingway (2000), William Faulkner: Six Decades of Criticism (2002), Zelda Sayre Fitzgerald (Palgrave Macmillan, 2004) and Hemingway: Eight Decades of Criticism (2009).